Little Dragon, yes. Tobacco, yes. Blitz the Ambassador lives up to his name, being one of the best Ghanian rappers you never heard of. Coalmine Records also releases a compilation of some the best underground emcees out there right now. Stones Throw also hits us off with the soundtrack for the soon to be released dvd Our Vinyl Weighs A Ton. And never forget the Legendary Lee Scratch Perry, who drops a double. Boom. It’s been a few years since I’ve listened to Black Milk, I just couldn’t get passed the preposterous, ubiquitous “BBBBLLLLLAAAAACCCCKKKKK MMMMMMMILK!!! !” overdub on every single track. Tiresome. But perhaps he’s finally letting his music speak for itself and give it some room to breath. Devin the Dude also had a bit too much output in too short of a time but it’ll be good to hear his voice again after these past couple years. I’m also looking forward to this Prefuse 73 and Teebs collabo under the name Sons of the Morning. The stand out up and comers of the week though I think will go to L’Orange and Stik Figure as well as Kwes. The City Under the City sounds pretty commanding and another welcome addition to the Mellow Music Group catalog. And Kwes, he’s on some mellowed out, electronic, crooning, good for a rainy day. Stones Throw Records blesses us with a free download of the last installment of JonWayne’s cassette series (the first one even got a cease and desist order from Coca-Cola). Peep it for some quality, eccentric beats and rhymes. More Brass bands in Hip Hop. They did this one for my birthday (tomorrow the 24th). Really, they did it just for me. This is what happens when you give portishead producers a 35 piece hip hop collective band and various emcee’s. This week the obvious stand out seems to be EL-P’s new one Cancer 4 Cure. 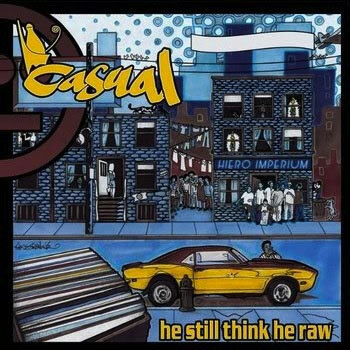 I’m also looking forward to a listen to Casual’s (Hieroglyphics) new one. And for you Madlib heads, a special box set of all 13 Medicine Show cd’s, honestly though I’ll probably pass on that cuz he just went overkill and I lost interest. Finally, Bruce Haack Remixes. Definitely.